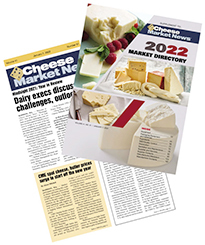 Included with each year's subscription is a free copy of the Cheese Market News Market Directory, a $45 value. For a full review of our product line, or to order a subscription/renew online, please click here. For questions about your current service or to request subscription information via email, click here. For Fax or Mail Orders, please click here to download an Adobe Acrobat PDF Order Form.